Send a tweet of your current iTunes track, title, and artist. Is there a better alternative to Twunes? Is Twunes really the best app in Internet Utilities category? Will Twunes work good on macOS 10.13.4? Twunes... So you're a Twitter AND a music addict? Ever wanted to know what your ("I'm a Mac") Twitter buddies are listening to on iTunes? Always looking for musical inspiration to widen your musical horizon? 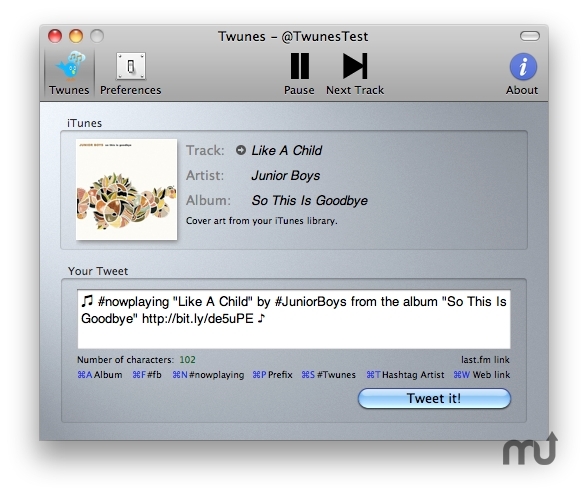 Well, good news: here's Twunes, my free Mac OS X application that tweets the current iTunes track's title, artist & optional album that you're listening to. You can hashtag the artist name so that it's clickable in Twitter clients and you can find other people tweeting about the artist you're listening to. You can add the hashtag #nowplaying. Twunes needs a rating. Be the first to rate this app and get the discussion started! You can add the hashtag #fb to crosspost your tweet to Facebook, too! You can add an iTunes Music Store (iTMS) link for your song - if it's available. Twunes tries to find a match. The cover art of the currently playing song is shown if possible. You can choose whether to include the album name or not. As a convenience you can remotely control three key iTunes functions: play, pause and next track. Your Twitter credentials are stored safely in Mac OS X's Keychain. Twunes can optionally stay on top of all other windows.